Created by security expert Troy Hunt back in 2013, Have I Been Pwned? is a website that lets you check if your personal data has been compromised by data breaches by collecting and analyzes hundreds of database dumps. It allows users to search for their own information by entering their username or email address, with the option to sign up to be notified if they’re detected in future dumps. One thing you may not know is that a password like “ji32k7au4a83” is more commonly used than you think, according to Robert Ou, and it’s a simple reason actually, as it’s comprised of characters from the Zhuyin Fuhao system for transliterating Mandarin. Read more to see a picture of the Chinese keyboard, and how the characters come about. Released in November 1992, Codemasters and Camerica’s Aladdin Deck Enhancer is basically a cartridge-based system that enabled you to run software on Compact Cartridges on the NES. Unfortunately, only seven of the twenty-four planned games were released before production was ended. Simply put, this accessory contained a bypass Security Circuit Chip, a Memory Control Chip, and a Graphics Chip that would work with the lock-out chip and other features inside the Nintendo Entertainment System. The goal was to provide a lower-cost way to make the game cartridges. Read more for another video and additional information. You may have never heard of the Cellebrite UFED (Universal Forensic Extraction Device), but it’s used by the police, FBI, Department of Homeland Security, etc. on smartphones, memory cards and more. Typically, current models cost around $15,000, but cybersecurity researcher Matthew Hickey managed to pick up several UFEDs from eBay for just $100 each. He found details on what phones law enforcement officials searched, when they were accessed and the data retrieved. Read more for a video showing how it works. Energizer’s Power Max P18K Pop is the world’s first smartphone to pack an 18,000mAh battery, but it comes at a price. Sure, you’ll be able to make 90hrs of calls, listen to 100hrs of music and watch around 2-days of video on a single charge or 50 days is standby mode, but the device is as heavy as a brick. Featuring a 6.2″ FHD+ screen, MediaTek Helio P70 chipset, 6GB of RAM, 128GB of storage, and five cameras, of which TWO are front-facing in a “pop-up” housing. There’s no pricing information available now, but the handset will launch this summer. Read more for another hands-on video, additional pictures and information. The LaFerrari, also known as the Ferrari F70, is a limited production hybrid supercar that is powered by a longitudinally-mounted Rear mid-engine, rear-wheel-drive layout Ferrari F140 direct injection 65° V12 engine producing 789 hp)at 9,000 rpm and 516 lb⋅ft of torque at 6,750 rpm, paired with a 161 hp KERS unit that provides short bursts of extra power. Unfortunately, this strange knockoff from Malaysia won’t be fooling anyone, but at the least its body was constructed entirely from sheet metal, rather than around another car, such as the Pontiac Fiero or Toyota MR2. Read more for additional pictures and information. 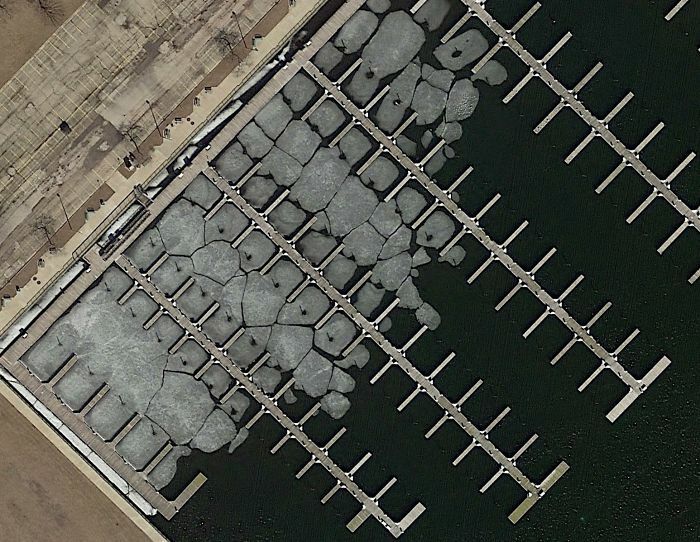 Google Earth has been around for quite some time, but its users are still finding interesting sights from around the world, like this marina in Milwaukee with some winter ice breaking up. “This is my favorite. It’s a marina near Milwaukee, Wisconsin (USA). The winter ice is in the process of breaking up. I don’t know why, but this is very visually appealing to me,” said this anonymous Google Earth user. Bored of Earth? The computer program also has globes for the Moon and even Mars as well as a tool for viewing the night sky. Read more to see additional sightings.